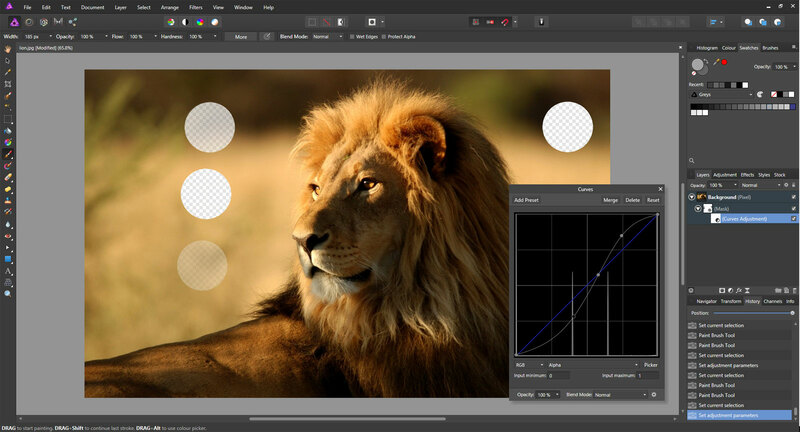 You don't need to add a mask to and adjustment layer or to a live filter, in Photo you can already paint on any adjustment or live filter and that will already work as a mask. To tweak the contrast of the mask, simply add a Curve to the adjust. or live filter, pick Alpha from the drop down menu in the Curve and tweak the curve as per your needs. Ok, another question. How do I see how the B&W mask changes when I make curves adjustments to it? In Photoshop when I ALT+CLICK on the layer I go in the mask and then with CTRL+M I can start making curves adjustments and see the B&W mask changing. However, in Photo when I ALT+CLICK on the mask to see it and then double click on the adjustment layer, I go out of the mask. Sorry for the dumb question. It's not a dumb question, in fact as far as I know, is not possible. Hope someone will prove me wrong. My own dumb question: How do you apply a Curves adjustment to a mask layer? I can't seem to do that -- the adjustment always is applied to the layer being masked, not to the mask layer itself. Also, the Order buttons on the main toolbar seem to work in reverse when applied to either the curves adjustment or mask layer -- "Back one" moves either of them up one & visa versa. Adjustment layers apply accordingly to your custom setup in the assistant manager. As far as applying the adjustment layer it works the same as I showed in the gif in my post above. What setting in the Assistant Manager allows this? I still can't get it to work to apply a "(Curves Adjustment)" to a "(Mask)" layer. This applies to Alex_M's second question about seeing how a mask layer changes "when I make curves adjustments to it." Wow, very confusing, I'm working too much, although I'm re-reading your questions and I can't understand the problem. So, let's recap: you want to apply a Curve adjustment to a mask layer, is that right? If so, I posted two gifs, none of them helps? Your second gif seems to be showing two Curves Adjustment layers applied to a Background layer. Nowhere in either one do I see a mask layer -- all have the half filled circle icon badge indicating adjustment layers, not the slashed square one indicating a mask layer. 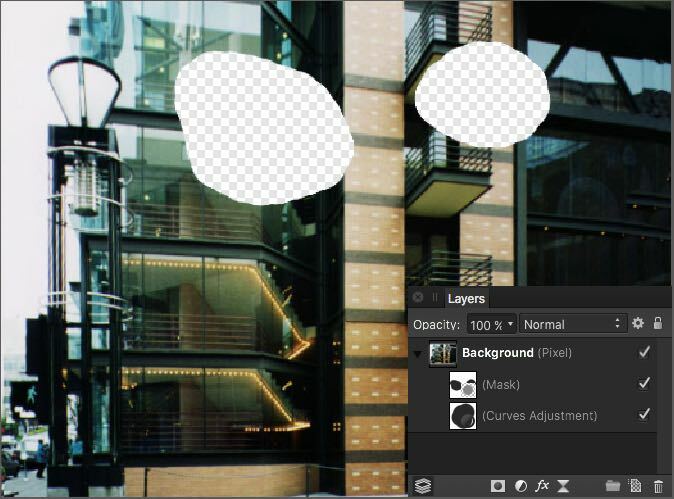 I know that but I am asking specifically if it is possible to apply a "(Curves Adjustment)" to a "(Mask)" layer. Earlier, Alex_M asked, "How do I see how the B&W mask changes when I make curves adjustments to it?" verysame replied that this is not possible, but right-clicking on a "(Curves Adjustment)" or a "(Mask)" layer offers an edit option that shows the mask in the same way, with the alpha represented as a grayscale image. It is also possible to refine both types of layers in the same way or to "paint" on them with a brush just by selecting them, thus allowing the user to see the changes doing that makes. This is why I am confused & asking about applying a "(Curves Adjustment)" to a "(Mask)" layer. Again, this does not work for me. I am talking specifically about a preexisting mask layer -- one identified as "(Mask)" in the Layers panel. I cannot move an adjustment layer into the the mask position (vertical blue line) on the "(Mask)" layer. No matter where I drop it in the Layers panel it is not applied as a "mask to the mask," only to the same layer that the mask is applied to. I have no idea what using the alt key has to do with what I mentioned. As I said, it is possible to "paint" on the mask directly by selecting it & see the effect that has immediately, or to see and/or to modify the mask by itself representing in greyscale using one of the menu options revealed by right (CMD) clicking on the layer, or for an adjustment layer to modify it using its window controls & immediately see its effects. It doesn't work for you because you are using a vector object as a clipped object and obviously is doesn't work as a mask. It simply puts the vector object inside the area occupied by the main pixel layer. When then you add a Curves Adjustment to the clipped vector object and set it to Alpha, it only affects the vector object an not the main pixel layer because the vector object is not being used as a mask. It's just a clipped object that happens to be placed "inside" the main pixel layer. If you use a raster mask as a clipped object it will act as a mask over the main pixel layer too and thus the main pixel layer will also be affected by a Curves Adjustment operating over the raster mask. It doesn't work for you because you are using a vector object as a clipped object and obviously is doesn't work as a mask. But I am not using a vector object as a mask. For example, I open an existing jpeg in Photo. It has one pixel layer with the default "Background" name. With it selected, I click on the "Mask Layer" button at the bottom of the Layers panel, creating a Mask layer applied to the Background pixel layer. With the Mask layer selected, I 'paint' with a black brush to mask part of the Background layer. As far as I know this is a pixel mask. Next, I click on the Adjustments button at the bottom of the Layers panel & select a Curves adjustment. It does not matter if I have the Mask layer selected at that time or not, the Curves Adjustment layer is not applied to the mask layer. I can drag the Curves Adjustment layer onto the Mask layer thumbnail (& get the vertical blue line) but when I drop the layer there, it simply stacks it below the the Mask layer, not indented below it, so both the Mask & Adjustment laters are applied to the Background layer. The attached screen shot shows what I mean. The two transparent sections are the result of painting on the mask layer; the layer order shown is the result of dragging the Curves Adjustment layer onto the Mask layer thumbnail. Clicking on the Order buttons in the main toolbar with either the mask or adjustment layer selected simply reverses their order (opposite of the expected back one or forward one action). No matter what I drag where, the only stacking order I can get is mask above adjustment or visa versa, but neither is in the layer clipping position for the other. I think it's going wrong when you "click on the "Mask Layer" button at the bottom of the Layers pane"
I've mentioned the vector object as mask because that's what you were talking about when you mentioned the slashed square as icon (in the quote above). The slashed square indicates a vector mask layer. Now you are talking about a raster mask which is a different thing. If you use the raster mask as a clipped layer (rather than nested to the pixel layer) then nest the Curves Adjustment to it, it will work as carl123 already pointed out. Thanks, Carl. That seems to work (with the addition of dragging the mask layer onto the Background layer so it matches your screenshot). It is sort of weird that in this configuration I cannot select the mask layer individually to paint on it, but that I can select the Curves Adjustment layer independently & use the "Edit Adjustment" or "Refine Mask ..." right click options on it ... & that I can select the mask layer individually after using the "Release Adjustment" option on the adjustment layer & then dragging it back to the nested (?) position below the mask layer. I don't understand why that happens or why it is necessary after clicking on the "Mask Layer" button (which as expected adds a mask to the background layer) to then drag it out of the nested position so it does not at that point mask anything. By default, a created mask layer is clipped to the selected layer or added at the top of the Layers panel if no layer is selected. It can be moved within the Layers panel to affect greater or lesser areas. From this I assumed that I was creating a clipped layer when (as that help section says) I clicked the Mask Layer button with the Background layer selected. I also don't understand why, from the un-nested layer stack shown in my screenshot (Adjustment above Mask or visa versa), there is no difference in the result if I drag the adjustment layer onto the thumbnail of the mask layer (vertical blue bar) or to below it into the nested position (horizontal blue bar), or visa versa -- the dragged layer always ends up in the nested(?) position. From a UX standpoint, to avoid user confusion I would think only the nesting drag should work. Finally, regarding selecting the mask layer individually, I realized that I can select it individually (as indicated by the black border around it) but only after using the "Release Adjustment" option on the adjustment layer & then dragging it back to the nested (?) position does it highlight individually without also highlighting the adjustment layer. This does not always happen but I think it never should -- the behavior should be consistent, right? Also, as mentioned by others, there does not seem to be any way to view the mask layer alone (the Edit Mask option) when nested this way. Basically, there just seems to be several inconsistencies in how all this works. Actually the mask is nested not clipped to the selected layer (this depends on a setting on the Assistant). I will pass this to the documentation team to be checked. Yes, with nested items seems there's a few issues when dragging their positions in the Layers panel. Clipping seems to work fine. Still looking into this. One other thing: Referring to the attached screenshot, how do I tell if the mask layer in the clipping or layer masking nesting position? I get exactly the same display if I drag the mask onto the Background layer thumbnail (vertical blue bar) or its title area (horizontal blue bar). I know they are different because when dragged onto the thumbnail right-clicking on the mask layer gives me the Edit Mask, refine Mask, etc. menu options, but dragged into the Background layer title area does not, instead giving me the much longer Cut, Copy, Paste, Rasterize, etc. menu options. Currently your mask is clipped. Nested layers have a bigger left indent - they also display a thumbnail on the right of the background image thumbnail when the pixel layer is collapsed in the Layers panel. Regarding the contextual menus only a nested mask gives you access to the smaller mask contextual menu when you click over its thumbnail. When you have a mask clipped to the image layer you are simply placing it inside the boundaries of the background layer. Visually they affect the parent image layer in similar ways but conceptually they are slightly different, I think most of your confusion comes from the difference of context/concept between a nested item which affects the parent as a whole and a clipped item which is limited by the boundaries of the parent element. Regarding the setting on the Assistant, I assume you mean the "Add mask layer to selection" one with the two choices being "Add mask as child layer" & "Add mask as new layer," right? If so, perhaps the former should be labeled "Add mask as clipping layer" to make this more explicit. In general, there seems to be more confusion than necessary about "child" vs. "clipping" layers, or maybe that is just me?